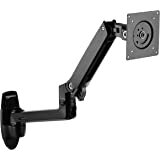 Sold by Flylinktech and Fulfilled by Amazon. Gift-wrap available. 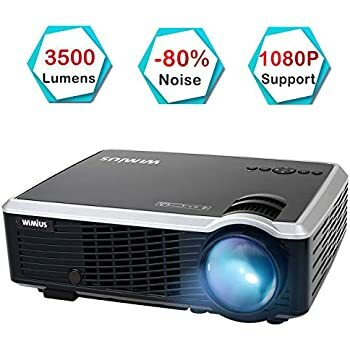 Amazon's Choice for "wimius projector"
UPGRADED 4000 LUMENS HD PROJECTOR: With 2019 upgraded 4000 lumens and a contrast ratio of 3000:1, this movie projector can bring you very sharp and clear images even with a little light on. It will bring you real cinema experience both indoor and outdoor. 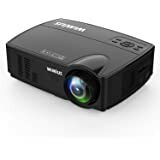 FULL 1080P SUPPORTED: The native resolution is 1280*800, which is much more clearer than 2600 lumens 800*480 led projectors. Moreover, it can support full HD 1080P videos, which serves your eyes better. 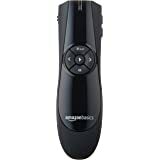 It's ideal for movies, football games and parties etc. 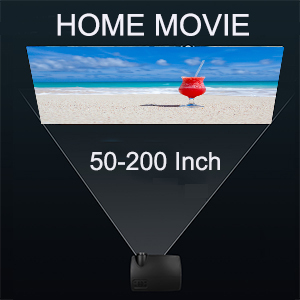 ENJOY BIG SCREEN AND FIDELITY SOUND: The projection size is 50-200 inches with projection distance of 1-5.5m. The optimum projection distance is about 2.5-3m. 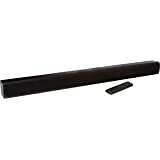 In addition, it’s built in HI-FI speaker, so you could enjoy fidelity stereo sound in every corner of the room. 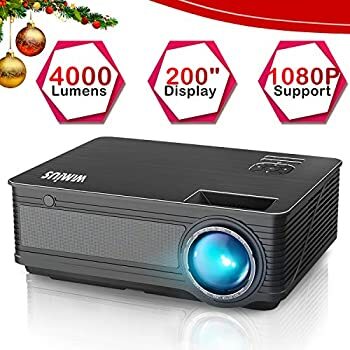 IMPROVED COOLING SYSTEM AND LOW FAN NOISE: This video projector is equipped with an innovative cooling system with heat dispersion, as well as the fan sound cut in half, lower than other home projectors, which is more suitable for watching movies or playing games. 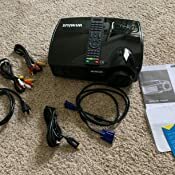 MULTI-CONNECTION AND 2 YEARS WARRANTY: The package comes with a HDMI cable and VGA cable. 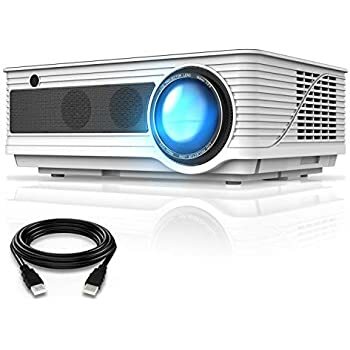 You could connect the projector with TV box, computer, VCD/DVD player, amazon fire TV stick, Roku and so on. To connect with iPhone/iPad/Android phone, an external HDMI adapter is needed. 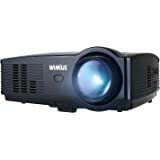 What’more, it includes 2 years free warranty, so really no worry to take our projectors. 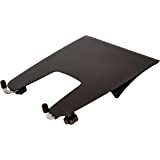 Sold by Flylinktech and ships from Amazon Fulfillment. 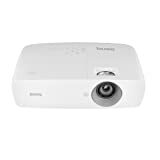 With 50-200 inches flexible projection size, no matter how big your home is, it can create a real cinema for you and your family. To change the screen size, you could move the projector closer or farther to the screen. 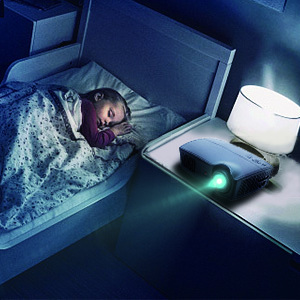 The advanced LED lamp can last up to 50,000 hours, which twice time longer than other LED projectors. 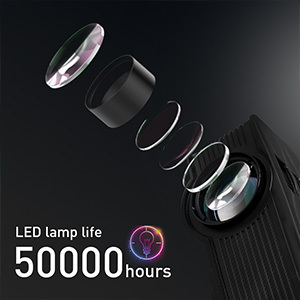 Warm tip---please don't look directly into the LED lamp, in case the strong light hurt your eyes. 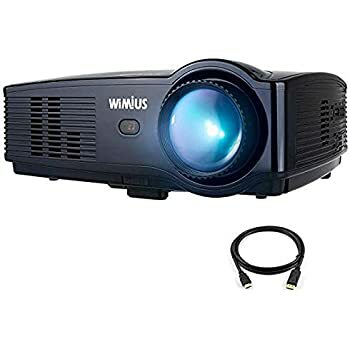 The WiMiUS projector is built in with stereo surround speaker, which restored every detail sound effect to let you enjoy the pleasure sounds in different scenes. There's no need to worry about rust or wear-and-tear. They make great additions to your movie night with your family. 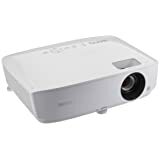 This home theater was equipped with the latest cooling technology to make the heat disperse at a faster way instead of staying within the projector, which will longer the lifespan of the projector. PS: when you turn off the projector, don't unplug the power supply immediately. 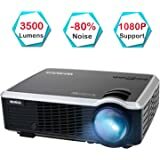 All kinds of projectors would produce fan noise. 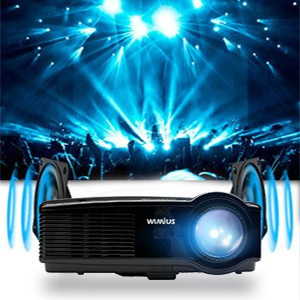 With WiMiUS T4 projector, if you keep 1 meter away from the projector, the fan sound won't disturb you and your family. PS: We suggest don’t put anything around the vents of the projector. 1. If no sound, please turn off the dolby of the input devices. 2. If you don't know how to connect with smartphones, let us know. 3. For all home projector, the whole screen couldn't be focused at the same time. The edge is not as clear as center. True, I'd like it to be brighter and like it to have better keystone adjustment but for the price this is a super value. 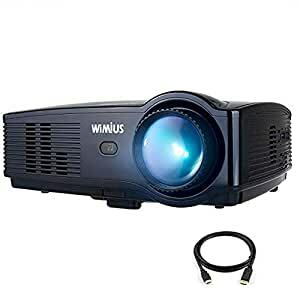 It's worked quite well for several months—we use it in a conference room and while this projector is *not* intended for presentations (the focus isn't quite 100% across the entire screen) it is more than good enough. We do have to turn the lights off but that's due to our mounting it so far from the wall it's projecting on. Moving the projector closer to the 'screen' will help the brightness, but we'd need to hang it from a suspended ceiling and that's likely to be wobbly so we'll live with what we have for now. Decent price and images are clear. got this for our family movie night. Normally we will gather our family and friends to a movie theater once a while. but not this time. we all joined in my living room. This is big saving, just image how much each ticket cost to cinema. Our family and friends enjoyed over this big screen and have much fun. thanks, we have great time. we have this on about a hour and half. 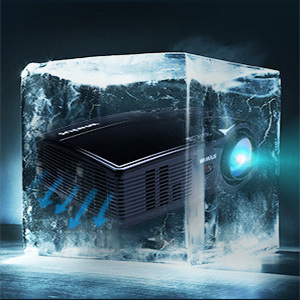 Surprise，the projector was not over heated. The fan that runs in the machine was in low sound. This is acceptable and it wouldn’t bother us. one suggestion, wish the power cord could be longer. i intend to move more but was locked with the limited of the cord. overall i am satisfied with this. Big saving and will continue to use more frequency. 5.0 out of 5 starsExcellent for the $$! Halloween display was a huge hit!! The project is very good you can zoom in and out so you can made the screen big or small and it is very HD too. 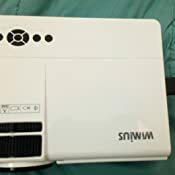 It also come with a remote controlled and have a lot of wire to connect to different devices and it is also no If it is day or night. Set up could not be any simpler. Opening the box you will find the unit it self, a power cord, remote controller with batteries and all necessary cables with paper word. 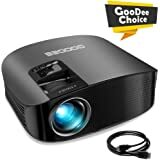 So this is kind of plug and play Home theater projector. 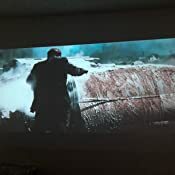 If you already have a projector screen set up then un-boxing to watching TV could be done in under 5 minutes. Just connect a source to one of the HDMI's and you're up and running. So set up is simple and fast. It also has an audio out port and HDMI ports that you can use for slideshows or as a power source for a different types of IP TVs and laptops. About the picture quality out of the box is amazing. I'm sure most will not have to adjust the settings. This unit is very bright and can be seen with lights on, window shades open in the day time and still get a good image quality. The wall I use has no direct sunlight on it which helps. 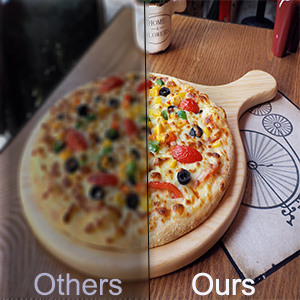 For movies time lights off, shades closed, The high contrast ratio gives great black levels and sharp images. I am just blown away with how great the picture quality is. 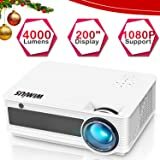 This projector is great and the picture quality is superb. So once you do have it setup with a good screen the picture is amazing. 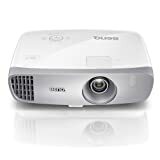 All in all, I am very impressed with this projector, the quality of it and how well it works. 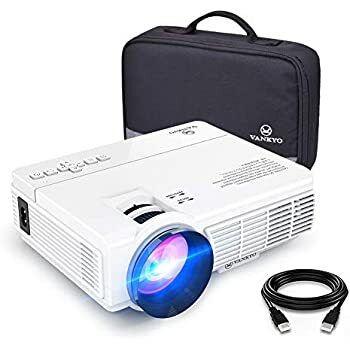 I would strongly recommend this projector for anyone looking for one to have for a home theater setup or for anyone that wants to use it for a variety of home entertainment uses. 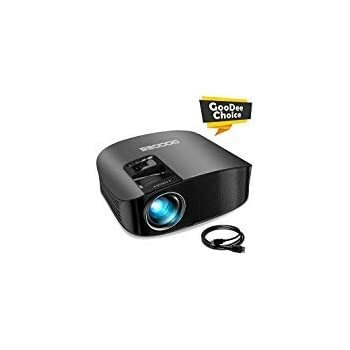 This a great projector at a great price point. We were looking for something to display images for Halloween and the upcoming holidays. Inside, picture quality, clarity, and details look high. Outside (we're projecting onto a simply white sheet, with the projector inside) images from the street are amazing. Definitely HD quality, that also depends of the source of your data, images, and movie files. One thing to note, and this was operator error. Our projector came with two USB ports. You have the option to scroll through various sources (USB, HDMI, computer, TV). We had apparently scrolled to USB 2 at some point. We placed our USB stick in the first USB slot and nothing. At first we thought it was defective. A quick inquiry to this vendor, who was very responsive, prompted us to try again. That led us to realize we were still using USB 2 as our source. A quick change back to USB 1 source and it worked perfectly. Maybe we were thinking that the USB ports fell under one source, so that was our error. LESSON: make sure you've selected the correct USB source. 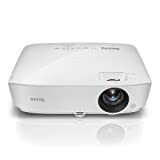 Overall, glad it wasn't a defect because we are very pleased so far with this projector. 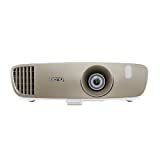 We like this projector very much. The video is very clear, we can use this with my iphone or ipad easily. 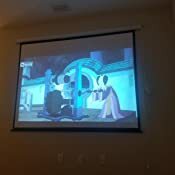 My kids can control the projector easily. We have more happy time with this one. The previous one is not as clear as this one, and this one is also more bright than the old one. I think I made the good choice.